Troubles and afflictions come to all of us, in varying degrees, at different times in our lives. Some seem small and can be handled in a short amount of time. Others are life-altering, traumatic and designed to stretch us to our limits. Sufferings are not a strange occurrence. We are well aware that trials come when we least expect them, but we also know that no one is immune and no one will ever have smooth sailing through their time on earth. It isn't something that should destroy our faith, just something that we know will come our way. The devil, however, will use these trying times to draw us away from God and toward sin. If he can lie to us and make us think that we are unloved, unwanted and unappreciated, he can talk us into thoughts and actions we wouldn't normally entertain. It's been his battle plan from the beginning (reread Genesis 3 and you'll see exactly what I mean), and it's the one he'll continue to use because he has no new tricks up his sleeve. At the opposite end of the spectrum, God uses those same troubles and afflictions to grow us, strengthen us and bring us closer to Him. Like gold in the fire, our trials can purify us and prepare us for future battles. What the enemy would use to paralyze us, God uses to change us and build us up in the likeness of Christ. The word count here means to lead something before your mind. Intentionally parade a thought across the screen in your mind. Positive personal thoughts and positive personal choices lead to personal growth. 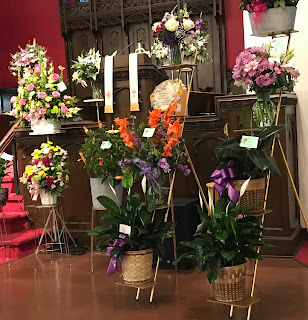 James says to think about your trials in a new and different way - not replaying the dark times over and over again, but choosing to look for what God sees. From His point of view, this is an opportunity for us to lay aside the hurt, the bitterness and the hopelessness and see that His hand has been upon you the entire time. 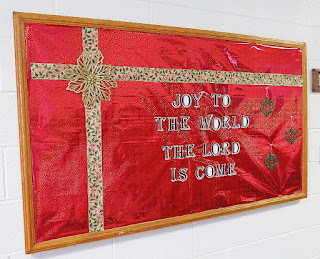 But count it all joy? Where is the joy in a broken heart, a battered relationship or a bruised mind? Where is the joy in the death of a loved one, in a long-standing argument or in a financial loss? Our peace of mind and heart is gone, so where is the joy supposed to come from? James explains it as simply as he can: knowing this, knowing that dark days will come to us all, our faith in God and God alone will change us. It will hurt, it will seem unreasonable, but the end result is more than just a ribbon or a trophy. The sound, steady belief in the great truths the Lord has given us will be our foundation when the world around us seems to be crumbling. It's easy to believe God's promises when times are good, but there is no stretching or strengthening in them. We can't build our endurance when we're comfortable and content with everything around us. Try this the next time you're at the gym - only do bicep curls until you start to feel a little uncomfortable. Run on the treadmill, but only until you can't breathe normally. Then do a couple of push ups, stopping just before your heart rate speeds up. If this was all your workout entailed, would you ever build muscle or lose weight? Of course not. 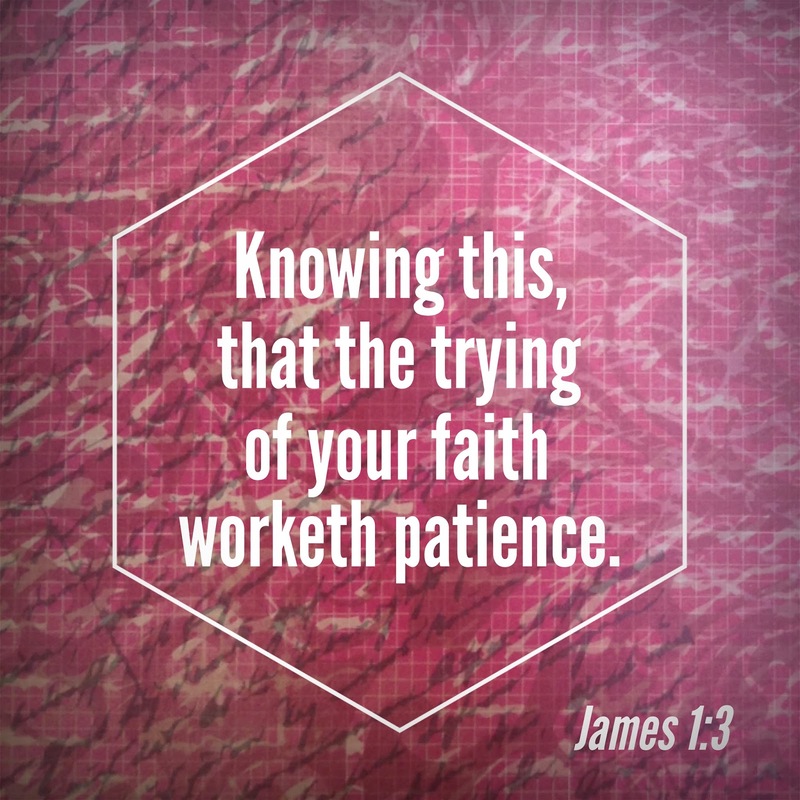 Our spiritual endurance and patience can only grow when we're going through a trial. It's not a happy experience, but the joy comes when we focus on how God is changing us for the good, how He's preparing us for something better at the other side of this valley. There's a mountaintop experience coming, and unfortunately the devil knows that. But if he can stop you from getting there, you'll be stuck where you are and will stop moving and growing. 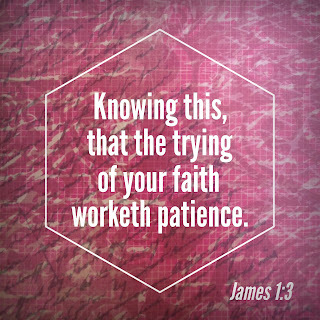 The trying of our faith brings patience. This difficult situation you're in will test you, possibly to your limits, but God has already defeated the enemy, planned your growth and will stay by your side until the pain subsides. He wants you to lean on Him when you feel you can't walk by yourself. He longs to hold you up, bind your wounds and heal your heart. Trails will come, but our personal choice to have faith in the promises of God will strengthen us and prepare us for the next step in our journey with Him. What joy there is in the precious promises of God.